Classes  most are limited to 5 in a class ~ Taught by nationally recognized writer and artist  local to your Chapel Hill & Carrboro Neighborhoods - for information on larger classes or to view pictures from former programs, please visit the Programs page. Offering lessons for children and adults. Small classes. Private Studio in rural Chapel Hill minutes from downtown Carrboro as well as Chatham County line. 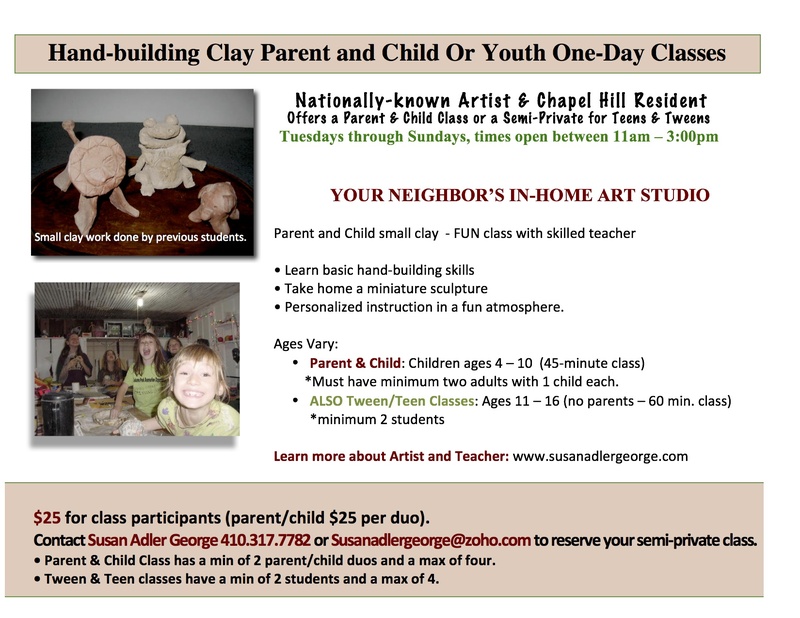 Small clay class with skilled teacher, who has 25 years experience. Minimum is 2 students per class, maximum is 4. *Evening classes available upon request with a min of two students. **Maximum 4 students per session. Prices: $25 for one two-hour class per person includes supplies. • Personalized instruction in a fun atmosphere. *Must have minimum two adults with 1 child each. $25 for class participants (parent/child $25 per duo). Contact Susan Adler George 410.317.7782 or Susanadlergeorge@zoho.com to reserve your semi-private class. • Parent & Child Class has a min of 2 parent/child duos and a max of four. • Tween & Teen classes have a min of 2 students and a max of 4. Reclaimed paintings and glue supplied. 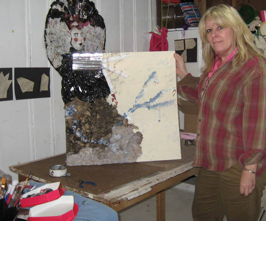 You create an inspired work of art that represents your memories, dreams and passions. All you bring is your mixture of: mismatched earrings, broken buttons, labels, favorite broken eyeglasses, beautiful match boxes, old photos, pencil shavings, lace, old thread, material, watches, misc. and a sense of eagerness !! !